Community and professional events reached tens of thousands of people across the country in 2018. Near Baja, Hungarians and Serbs shared music and friendly rivalry at a joint Hungarian-Serbian Danube Day in Érsekcsanád. The event brought together communities, high-level officials and local government from both sides of the border for a weekend of sport, speeches and traditional fish soup. The Budapest Danube Children’s Festival found a new home at Budapest Zoo. The fun-filled family day of river themed games, hands-on experiments, crafts and quizzes proved as popular as ever. Also in the capital, an international conference on plastic pollution was hosted by the EU Interreg Danube Transnational Programme JOINTISZA project. The free event provided a networking platform for those involved in influencing policy, involving technical experts from Austria, Hungary, Slovenia, Ukraine and the IUCN. Region-wide measures to tackle pollution were developed for possible inclusion in the Integrated Tisza River Basin Management Plan updates. A ‘trash art’ exhibition ran alongside the event. Győr’s water-based fun was a hit at the Győrkőc youth festival. 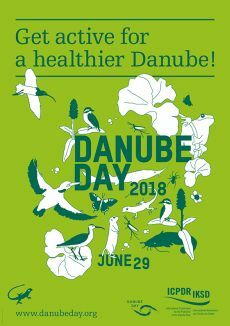 As were activities at Gönyű's Danube Day celebration of boats, which included fishing contests, boating, folk dancing and live music. To see how all the countries celebrated in 2018, go to Review 2018. You can also revisit 15 years of Hungarian Danube Day celebrations via the general Review page. Ida Nagyne Sos of the Ministry of Interior on +36 1 441 1795; +36 30 491 2624; ida.sos.nagyne@bm.gov.hu. For Hungary's Danube Art Master contest, view the Hungarian factsheet or contact Attila Kozák of GWP Hungary on +36 1 3711 333; gwpmo@gwpmo.hu.